Home Page Continued - Early History of Photography in Edinburgh to be found on on the www.edinphoto.org.uk web site. In 1839 Talbot in England and Daguerre in France announced their discoveries of photography. 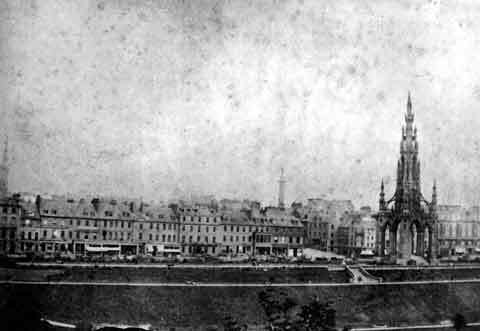 - James Howie held a daguerreotype exhibition in Princes St.
From 1843 until 1847, Hill & Adamson produced several thousand calotype photos from their studio at Rock House, Calton Hill, Edinburgh. Several Exhibitions will be held in 2002 to celebrate the bi-centenary of Hill's birth. During the 1840s, professional photographers including Davidson, Howie, Popowitz, Ross, Thomson and others established studios in Princes Street. They were able to carry out their business free from the calotype and daguerreotype patents that applied in England and Wales. - in 1861: Edinburgh Photographic Society (EPS) which still exists.